First of all, what is a Traveling Classroom? Our Traveling Classroom makes it possible to travel and learn Spanish at the same time. During this four-week tour you will travel to three different places in Panama. Finally you will stay for one week in Costa Rica. Not only will you study Spanish in each location but also take part in amazing activities. 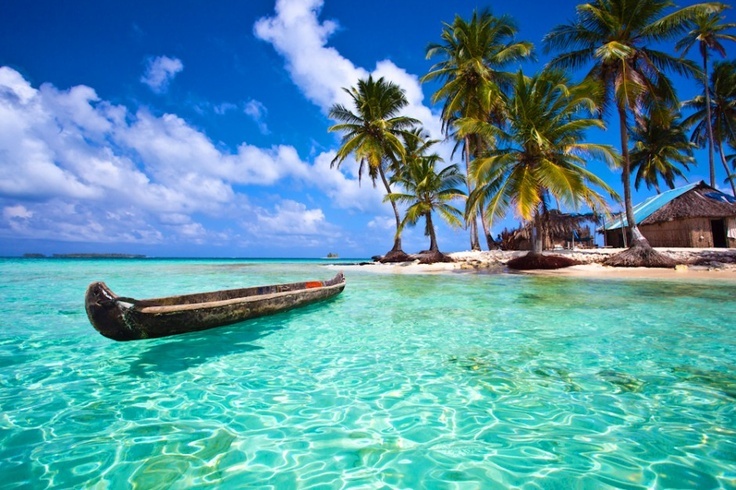 For example you will take a trip to the gorgeous San Blas islands and you will go rafting in Costa Rica. To summarize you will visit Panama City, Boquete and Bocas del Toro in Panama and Turrialba in Costa Rica. To begin with the tour starts with a pick-up from Panama city airport to hostel Posada 1914. Accommodation this week is in a shared room. Altogether you will only have three days of Spanish during the first week. From Monday through Wednesday. Because on Thursday you will have the first of many great excursions, you will go tot San Blas islands. Here you will stay for two night in simple accommodation. As can been seen from this picture San Blas is an archipelago of mostly uninhabited sand islands off the coast of Panama where you can go snorkeling in crystal clear waters. Sunday: Pick-up and transfer to the hostel, at night get together to meet the other participants. Monday: Morning group Spanish course. In addition, in the afternoon walking tour casco viejo. Tuesday: Morning group Spanish course. In addition, afternoon tour to miraflores lock / museum. Wednesday: Morning group Spanish course and afternoon latin dance classes. Thursday: Departure to the San Blas islands. Together with the group and teacher travel by local bus and boat. Friday: Full day at this beautiful island to relax and snorkel. As well as a boat trip to several small surrounding islands. Saturday: Together with the group you return to Panama City by boat and bus, one last night in Posada 1914, before going to Boquete the next day. This week you will get a full week of Spanish classes from Monday through Friday. Classes are in a small group and typically in the morning. Some afternoons there will be activities and some afternoons are free to relax and enjoy the surroundings. Again, accommodation will be in a shared room at the school. Sunday, travel by local bus from Panama City to Boquete. Additionally you get a welcome drink upon arrival. Monday, 4 hours of group Spanish course. In addition afternoon activity: cooking classes. Tuesday, 4 hours of group Spanish course. As well as an afternoon activity which will be an exciting canopy tour. Wednesday, 4 hours of group Spanish course. In addition the afternoon activity: Latin dance classes. Thursday, 4 hours of group Spanish course and a free afternoon. Friday, 4 hours of group Spanish course. Together with the other students you will join the Friday night BBQ. Usually the students buy the food, the school will arrange the drinks. Saturday, travel day. Together with the group you travel by bus and boat to Bocas del Toro. This week you get to spend on the beautiful island of Bocas del Toro. Spanish classes from Monday through Friday in a group. Ordinarily, the classes are in the morning but they can also be in the afternoon depending on the activities and other factors like weather. Again, accommodation in a shared room at the school. Monday, 4 hours of group Spanish course and a free afternoon. Tuesday, 4 hours of group Spanish course. In addition, afternoon activity: cooking classes. Wednesday, 4 hours of group Spanish course. In addition, afternoon activity: Latin dance classes. Friday, 4 hours of group Spanish course and usual Friday night BBQ. Saturday, free day with optional tours. Finally, the last week of the Traveling Classroom you will go to Turrialba Costa Rica. Here as well, five days of group Spanish course and accommodation at the beautiful school building. And, on the last weekend you will go on a rafting trip. Together with the other participants, you will go camping near the river. Also, you will go rafting twice! Immediately after the rafting trip you will have transportation to the bus station of Siquirres, this is where the tour ends. Tuesday, 4 hours of group Spanish course. In addition the free afternoon activity is a cooking class. Wednesday, 4 hours of group Spanish course. In additional you will have Latin dance classes. Thursday, 4 hours of group Spanish course and free afternoon. Friday, 4 hours of group Spanish course and BBQ at night. Saturday, overnight rafting excursion at the Gekui river camp. Sunday, after the rafting trip, around 3 pm, drop-off Siquirres bus station where each student will go their own way. The traveling classrooms start on a Sunday. However, you can arrive earlier and we can add extra nights in the hostel in Panama city! Three and a half weeks (72 class hours) of Spanish course in a group of max. 6 students. Usually, there will be 3 or 4 students per group. 28 nights of accommodation based on shared rooms. Activities and excursions, as shown in the itinerary. All transportation from the arrival at the airport in Panama City to the last location Turrialba. Wifi Internet at the schools. No Wifi in San Blas or during the camping trip.